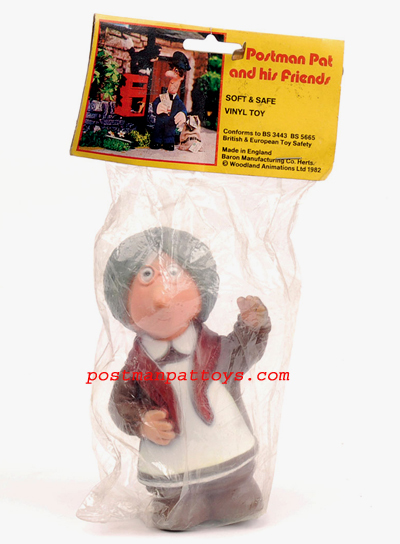 From as early as 1982 the Baron Manufacturing Company of Herts., England released vinyl Postman Pat figures. These were sold in a clear plastic bag with a printed header card. The hollow plastic figures had an internal squeaker, hence the figures have a small hole in the base. All had a fixed pose. The Baron Manufacturing Company has long since ceased trading. 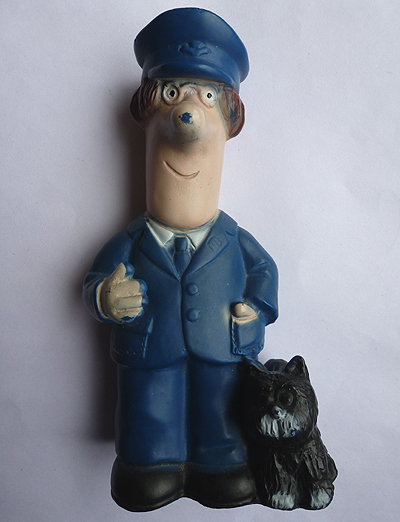 Original Baron Postman Pat figures in mint condition still bagged with the header card are very rare and highly collectable. Loose figures are easily identifiable as all are stamped on the base ‘Baron Mfg Co’. The Baron Pat figure stands around 5″ tall. 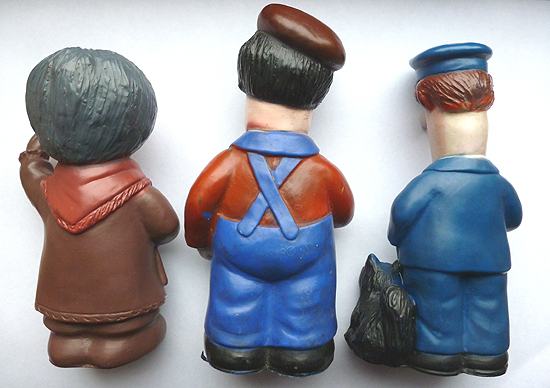 Baron Manufacturing released figures of Postman Pat with Jess, Mrs Goggins, Ted Glen and, not confirmed, Alf Thomson; there may be others. 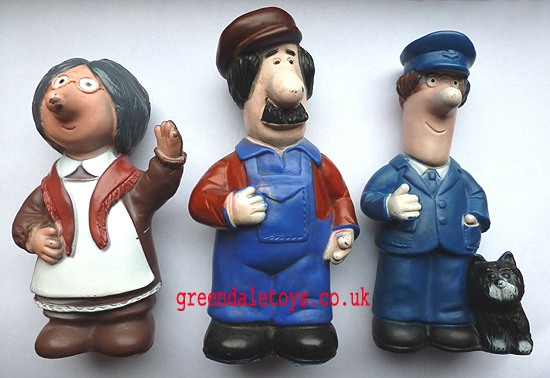 These are the most likeable Postman Pat figures. Chunky, crudely painted but very appealing and made in England. It is now quite hard to find good examples of the Baron figures. Many of them have paint rubs, especially on the nose. Often the sqeakers are defective or missing altogether. Also the plastic, though it must have started life quite soft and maleable for the squeaker to work, decades later is more often than not rather hard. 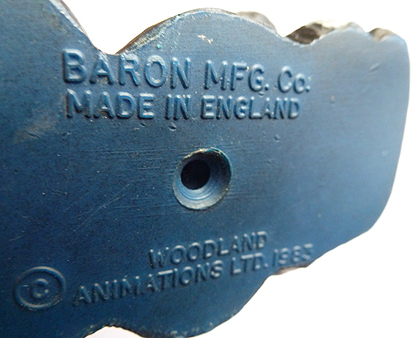 At some point Baron Manufacturing became Eaglet Industries Ltd of Hatfield Herts, or vice versa, as these figures can also be found bagged with the same printed header card, but made by a different company – see the picture below. At a guess, the Eaglet Industries version is a later release and appears to have a revised, deeper blue paint finish than the Baron Manufacturing version.Both are around 6″ tall, made of soft vinyl, and have a squeaker in the base. Both also have the date 1983 on the base.